Chipped tile is one of many types of property damage that can cause devalued property or additional home damage if not treated. For example, damaged tile in a bathroom can lead to mold and rot if not fixed and replaced by a professional contractor. Whether your tile floor was damaged due to normal wear and tear, by dropping a hard object on it, or by faulty installation to begin with, your homeowners’ insurance policy may cover the costs of repair. On the other hand, it may be denied by your insurer, which is often the case. Exclusions to coverage vary based on your specific policy. Insurance companies must pay for tile replacement that matches the style, color, and other appearance of the original tile work. This is to keep homeowners from having mismatched tiles that do not fit, cause a devaluing of the home due to appearance, or allow for water to seep in between the cracks. 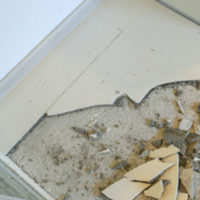 Replacing one or two worn out or cracked tiles yourself may not be an expensive repair job, but hiring a professional to do the job correctly and to keep your floor or walls looking the same as they did before the damage–that will inevitably cost much more, which is why filing a claim may be necessary. The average cost of tiling a medium sized shower is $2,000, according to improve.net. This, of course, depends on the quality of the tiles used, local cost of labor, and the size of your shower, floor, or wall, and the cost of repair can greatly exceed this $2,000 mark in many cases. The Fourth District Court of Appeals in Ergas v. Universal Prop. and Cas. Ins. Co., 114 So. 3d 286, 288 (Fla. 4th DCA 2013) upheld a ruling that has made it difficult for homeowners to receive compensation for tile damage ever since. In Ergas, the appellant dropped a hammer on the tile floor, causing damage. The damage to the tile was approximately the size of a hammer head, and the policy excluded damage caused by wear and tear, marring, and deterioration. The definition of “marring” or to “mar” is to disfigure or impair the appearance. This court’ decision has paved the way for other insurance companies to claim that the tile damage that their customers bring to their attention is simply superficial marring, not actual damage that could cause other problems, like water damage, down the road. If your insurance company has denied your chipped or broken tile claim due to their exclusions of wear and tear or marring, you need to speak with an experienced West Palm Beach homeowners’ insurance attorney. Call the Celeste Law Firm today to speak with one of our lawyers and to set up a consultation at your soonest convenience.